Kathmandu to Pokhara by bus or air. 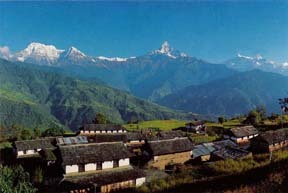 Take taxi or bus to Numle (1 hour) and trek to Ghandruk (1951m). 7-8 hours. 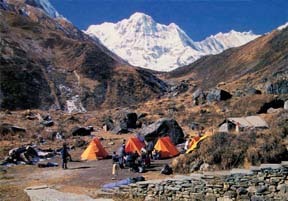 Continue trek to Chomrong (1951m), 6-7 hours. Trek to Doban (2606m), 7-8 hours. Trek to Machhapuchhare B.C. (3703m), 7-8 hours. Trek to Annapurna Base Camp (4130m), 2 hours. Trek to Dhampus Phedi and take taxi or bus ( ½ hour) to Pokhara.